ATC provided their December Q report and has released an update on the progress of the diligence process for its HPA project. DD is nearing completion and advancements have been made at both the Meckering project site and at the site of the intended HPA processing facility in Johor, Malaysia. We retain our Speculative Buy recommendation. ATC closing in on the final stages of German project financing: ATC are in the final throws of the technical and financial due diligence required by the German Government for provision of a US$70m debt facility from government-owned KfW IPEX-Bank. Should the DD be successful, US$60m of debt will be covered by the German Export Credit agency (ECA), providing a very low rate of interest. Developments in WA and Malaysia: ATC has made a number of advancements in developing both its Meckering kaolin deposit site in WA and at its prospective HPA processing facility site in Johor, Malaysia. A Mining Proposal and Mine Closure Plan have been submitted to the Department of Mines and Petroleum for the Meckering site in WA. In Johor, a site office has been established, soil and topographic surveys have begun and a permitting consultancy group has been engaged. Last remaining processing testwork required: The outstanding requests from the DD consultants relate to back-end processing testwork. Once the testwork is complete, which we estimate to be a matter of a few weeks, an expert opinion report will be produced which will form part of the final DD report for investment approval. Cash position and short-term funding: The additional testwork has put the DD completion schedule behind by two to three months in our estimate. As at the end of Dec Q, ATC had cash reserves of $4.7m. We believe that most of the heavy cash burn months are behind them, chiefly associated with external consultants required for the due diligence. The DD will be coming to a close late this Q or early Q2. We anticipate that a small, interim equity financing, to provide for 3-4 months of working capital, may be required and will be largely immaterial next to an imminent debt and equity project financing event. HPA future pricing looks positive: As part of the German DD process, a report was provided on forecast HPA industry metrics and pricing. The outlook for HPA to 2024 is robust. The global market is forecast to increase from 25,300 tonnes in 2016 to 86,800 tonnes by 2024, a CAGR of 16.7%. The report forecasts the long-term 4N HPA price stabilising around US$28/kg. ATC used a flat US$23/kg in their BFS financial models, an 18% discount to current price forecasts. Recommendation and Valuation: We maintain our Speculative Buy recommendation but decrease our risked valuation by 11% to take into account additional shares and a decrease in cash over the Dec Q. This moves our risked valuation to $0.32 from $0.355 per share. ATC has continued to progress its development of the High Purity Alumina (HPA) project both here in Australia at its Meckering deposit site and in Johor, Malaysia, the site of the intended processing facility. At Meckering, ATC submitted its Mining Proposal and Mine Closure Plan to the Department of Mines and Petroleum on 1 December, 2016. The operation at Meckering is essentially a quarry style operation, with a low tonnage production without the requirement for blasting. We therefore believe the applications should not meet major hurdles. Dust suppression will be required but mining will be on day-shift only for a period of two months, once every 3 years. Kaolin will be shipped year-long in sea containers at 45Ktpa to Johor via the Fremantle Port by Seatram. The maiden mineral reserve released last year of 1.2Mt at 30% Al2O3 (alumina) at a cut-off grade of 25% Al2O3 in the minus 300 micron fraction, will provide for a Phase 1, 30 LOM. ATC opened a Malaysian subsidiary office approximately 300m from the proposed site of the processed HPA plant at the Tanjung Langsat Industrial Park. The project coordinator (M+W Group), who will provide engineering, procurement and construction work, will also be based at the office during project construction. At the site itself, a soil and topographic survey was initiated to determine soil stability and analysis to feed into the engineering designs for the civil works such as piling and foundations. ATC has also engaged permitting consultancy group, WKL & Associates, to develop the development order and construction permit applications and for the various utility applications such as gas, power and water. ATC also participated in an official lease signing ceremony hosted by the Johor Corporation in Johor on the 23 November 2016. A 30-year lease agreement with a 30-year renewal option was executed with TPM Technopark Sdn Bhd, a wholly owned subsidiary of the Johor Corporation. By the end of the Dec Q, ATC’s EPC contractor, M+W Group, was approximately 60% of the detailed engineering design work is complete and data packages for the entire HPA plant have been submitted to chosen suppliers. Around 50% of these packages are now covered by returned binding quotations. ATC has been working with German Government-owned KfW IPEX-Bank for 12 months on project finance structuring. KfW and ATC jointly appointed several independent experts to provide due diligence on every aspect of the project. That due diligence is still being conducted but progress is being made after due diligence consultants requested a number of further pilot plant tests. ATC has received an indicative structure on the entire US$70m facility. At this stage, the majority, US$60m, will be subject to German export credit agency (ECA) cover at low interest rates. The remaining US$10m is likely to be on commercial terms. The terms are yet to be finalised, are indicative and are non-binding on either party. ATC has been required to undertake further testwork, chiefly on pilot plant testwork, in order to satisfy additional DD questions. Results of that testwork will undergo a detailed audit which will be submitted as part of the “expert opinion” resort. That testwork in now coming to a close. We believe the additional requests for testwork have delayed the finalisation of the DD report by 2-3 months. Once due diligence by the independent consultants is complete, an expert opinion report will be provided. Should this be successful, Steps 8 and 9 are then taken (See figure 2 below). Post Step 9, conditions precedent must be fulfilled to obtain closure and drawdown. These could relate to final approvals in Malaysia, obtaining the necessary equity portion of the project finance and other regulatory approvals for project commencement. As at the end of Dec Q, ATC had cash reserves of $4.7m. We believe that most of the heavy cash burn periods with development costs are behind them, chiefly associated with external consultants required for the due diligence. The DD will be coming to a close late this Q or early Q2. ATC forecast cash burn of circa $3.4m on development costs for the Mar Q, compared to $4.1, for the Dec Q. ATC forecast total cash outflows for the Mar Q of $3.7m after an R&D refund of $0.465m, leaving approximately $1.0m in cash at the end of the Mar Q. We estimate that, given the 2-3 month DD schedule over-run, some interim funding may be required to cover remaining DD, or to cover continued detail design work, until the debt financing package and coincident equity raise can be completed sometime in Q2 CY17. This would only amount to circa 3 months of working capital and with a project debt/equity funding package potentially around the corner, largely immaterial in our view. We anticipate that finalisation of the DD and negotiation of the terms of the financing package will be completed by 2Q CY17. An equity raise to support the project financing package will be required immediately thereafter as a condition precedent to the debt financing. As stated previously we anticipate a circa $40m equity raise. ATC and KfW commissioned a market analysis and forecast from independent research house Persistence Market Research to look at the HPA market in detail for the period 2016 to 2024. This report formed part of the project debt funding due diligence. Robust consumption growth: Global consumption of HPA increase 19.5% between 2014 and 2015, to 21,300 tonnes. The global market is forecast to increase from 25,300 tonnes in 2016 to 86,800 tonnes by 2024, a CAGR of 16.7%. Early in HPA product lifecycle: The report suggests that although HPA has been in use for over three decades, it is only in the last few years that HPA demand has dramatically increased. The report suggests that HPA is currently positioned at the mid-point in its growth cycle. The increased use of HPA has resulted from a recent and rapid uptake of LED’s and other electronic equipment. The growth in the LED market is set to continue, which is really the main driver behind the increased use of HPA. In addition, the lithium-ion battery sector is expected to grow enormously. HPA is now being used in li-ion batteries as a separator coating material to increase safety and reduce fire risk. 4N HPA still to dominate: 4N HPA (99.99%) is expected to continue to dominate the market of HPA going forward. ATC intend to manufacture 4N HPA. 4N will account for 72% of all HPA demand in 2024. 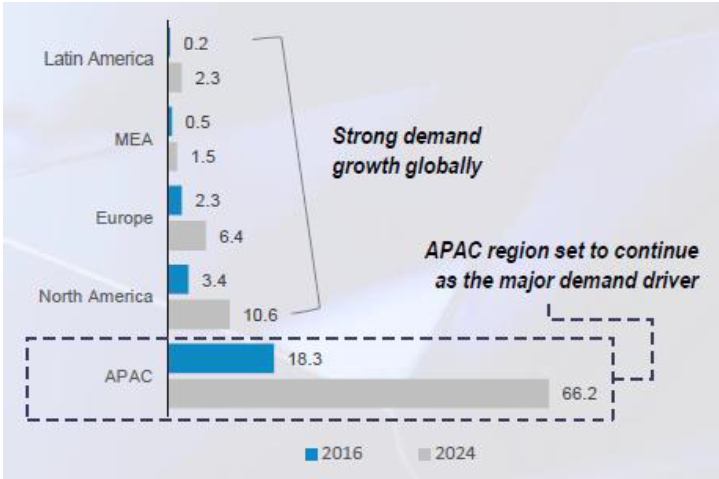 APAC to dominate demand: The APAC region is likely to continue to be the dominant region for HPA use given the high concentration of electronics manufacturing. Robust pricing to continue: The report forecasts that pricing for 4N HPA should stabilise at around US$28/kg. 4N HPA is currently being sold into the Japanese markets for ~US$30/kg. ATC has used a flat US$23/kg for economic modelling, as do DJC in our own models. Kaolin feedstock route likely to be at lowest end of cost curve: ATC’s processing route, using kaolin as feedstock, and ifs vertically integrated strategy is likely to place ATC at the lowest end of the HPA cost curve. Persistence forecast that one ATC 4000tpa plant will deliver a global market share of approximately 10% by 2019/2020. Low producer to buyer ratio: The dynamics of the HPA market reveal a low supplier to buyer ratio. The pricing power therefore rests with the suppliers to a degree and this should provide a shield to ATC by keeping pricing robust and by maintaining superior production margins to competitors. We have adjusted our valuation to reflect the increased number of shares from the recently completed capital raise. ATC currently has 266.188m shares on issue plus an additional 23.7m in unlisted options and performance rights. We maintain our assumption of an additional 155m shares for the project equity part of the project financing to raise circa $46.5m for a fully-diluted total shares on issue of 480m. Although ATC are making very good progress with respect to the project debt financing through the German ECA cover and KfW IPEX-Bank, we maintain our risked valuation metrics for the project, preferring at this time to wait until confirmation of the grant of ECA cover and final approval for the debt package before changing the risk profile and therefore the discounting. We adjust for an decrease in cash and additional shares on issue over and above our previous assumptions decreasing our risked valuation by 11% to $0.32 from $0.355 per share. We maintain our Speculative Buy recommendation and look towards the successful conclusion of the project debt financing as a major positive price catalyst. DJ Carmichael Pty Limited, members of the Research Team; including authors of this report, its directors and employees advise that they may hold securities, may have an interest in and/or earn brokerage and other benefits or advantages, either directly or indirectly from client transactions in stocks mentioned in this report. DJ Carmichael Pty Ltd holds an immaterial holding in Altech Chemicals Ltd. The analyst who wrote this report does not hold securities in Altech Chemicals Ltd. DJ Carmichael Pty Ltd provides corporate advice to Altech Chemicals Ltd and is paid a fee for these services. DJ Carmichael Pty Ltd acted as Lead Manager in two capital raisings for Altech Chemicals Ltd and was paid a fee for these services. In accordance with Section 949A of the Corporations Act 2001 D J Carmichael Pty Limited advise that this email contains general financial advice only. In preparing this document D J Carmichael Pty Limited did not take into account the investment objectives, financial situation and particular needs (‘financial circumstances’) of any particular person. Accordingly, before acting on any advice contained in this document, you should assess whether the advice is appropriate in light of your own financial circumstances or contact your D J Carmichael Pty Limited adviser. D J Carmichael Pty Limited, its Directors employees and advisers may earn brokerage or commission from any transactions undertaken on your behalf as a result of acting upon this information. D J Carmichael Pty Limited, its directors and employees advise that they may hold securities, may have an interest in and/or earn brokerage and other benefits or advantages, either directly or indirectly, from client transactions. D J Carmichael Pty Limited believe that the advice herein is accurate however no warranty of accuracy or reliability is given in relation to any advice or information contained in this publication and no responsibility for any loss or damage whatsoever arising in any way for any representation, act or omission, whether express or implied (including responsibility to any persons by reason of negligence), is accepted by DJ Carmichael Pty Limited or any officer, agent or employee of D J Carmichael Pty Limited. This message is intended only for the use of the individual or entity to which it is addressed and may contain information that is privileged, confidential and exempt from disclosure under applicable law. If you are not the intended recipient or employee or agent responsible for delivering the message to the intended recipient, you are hereby notified that any dissemination, distribution or copying of this communication and its attachments is strictly prohibited. The Author of this report made contact with the Altech Chemicals Ltd for assistance with verification of facts, admittance to business sites, access to industry/company information. No inducements have been offered or accepted by the company. The recommendation made in this report is valid for four weeks from the stated date of issue. If in the event another report has been constructed and released on Altech Chemicals Ltd, the new recommendation supersedes this and therefore the recommendation in this report will become null and void.